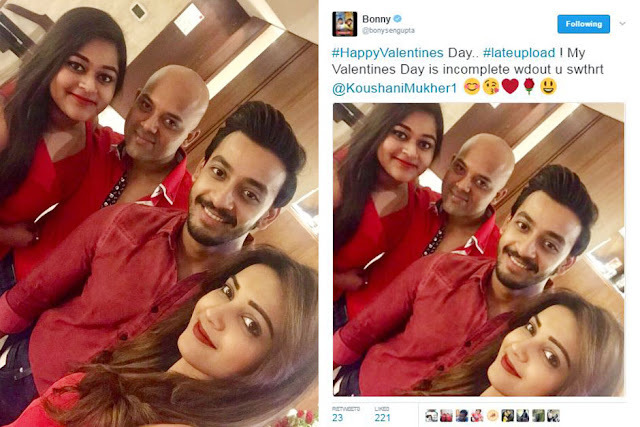 Tweet of Bonny Sengupta in this Valentine Day may have some clue about his relationship with Koushani Mukherjee. What happened in this Valentine's Day? Read this article and you will get idea. Koushani Mukherjee and Bonny Sengupta share a good relationship and they always kept their off-screen chemistry away from their fans and media. Koushani and Bonny are good friends, they go for long drive together, spend time with families of each other but never reveal that they are in love. A tweet from Bonny Sengupta at mod-night of 15 February have a clear cut indication of their relationship. No more explanation is needed. Bonny and Koushani are in love.